I think this was another purchase at the little candy store next to the barber where I’d get my hair cut. I know it was an issue that I’d seen and passed up in favor of other fare earlier, so it’s likely that a more limited selection made me take it home in this instance. I was a semi-regular reader of ACTION COMICS, so buying it wouldn’t have been much of a stretch. The Kurt Schaffenberger cover is appealingly cartoony, though it doesn’t carry a very convincing air of menace to it. The story is another one built around semi-recurring Superman supporting player talk show host Johnny Nevada, a thinly-disguised stand-in for the popular Johnny Carson and the Tonight Show. 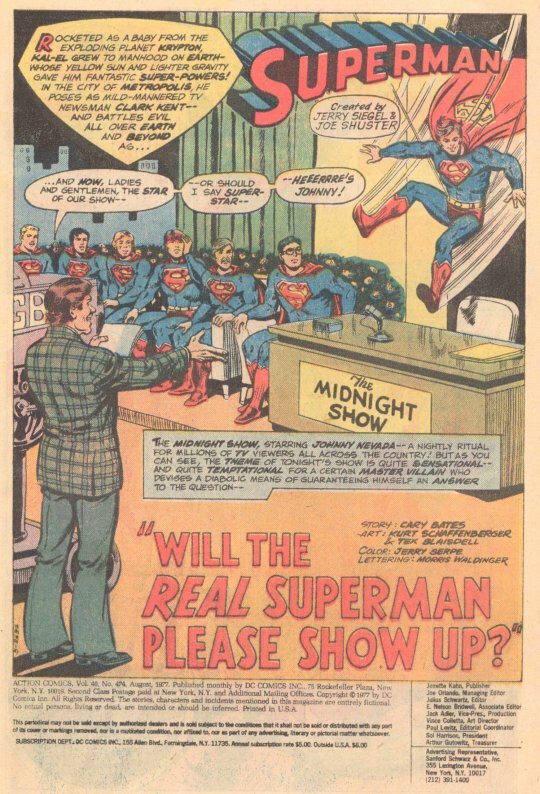 In this particular broadcast, Johnny has gathered together a long panel of guests, including Clark Kent–all people whom at one point or another had been suspected of being the true identity of Superman. Consequently, everyone on the panel is attired in Superman uniforms. The story opens with an action sequence of Superman battling an alien creature before zipping back to the Midnight Show studio, where he’s caught in the act of changing back to Kent. But since Clark is supposed to be wearing a Superman costume for the broadcast, this isn’t a problem. What is a problem is that Doctor Light is attending the taping in the audience. He’s convinced that the real Superman will be in attendance as well, and so he blankets the room with a specialized light device that will pass through normal people but will bounce off of Superman’s impervious body. 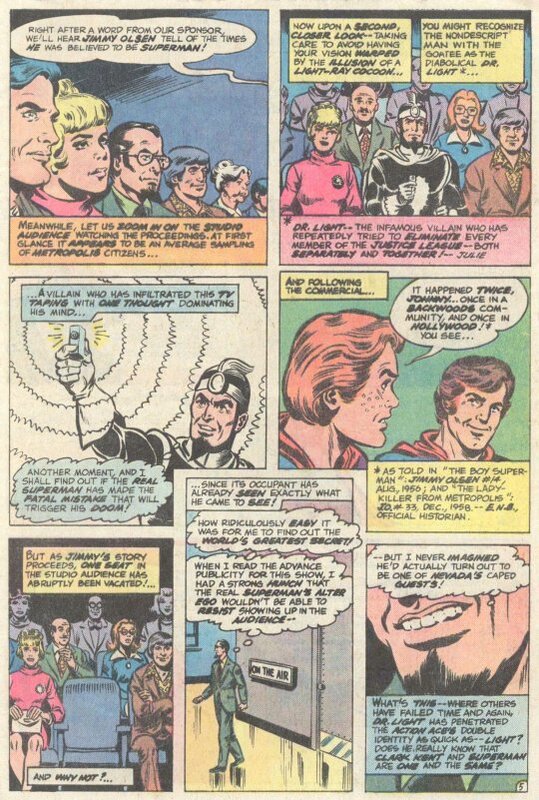 Light is stunned when his device shows that one of the guests on the dais is really Superman–Olympic champion Mike Talbot. 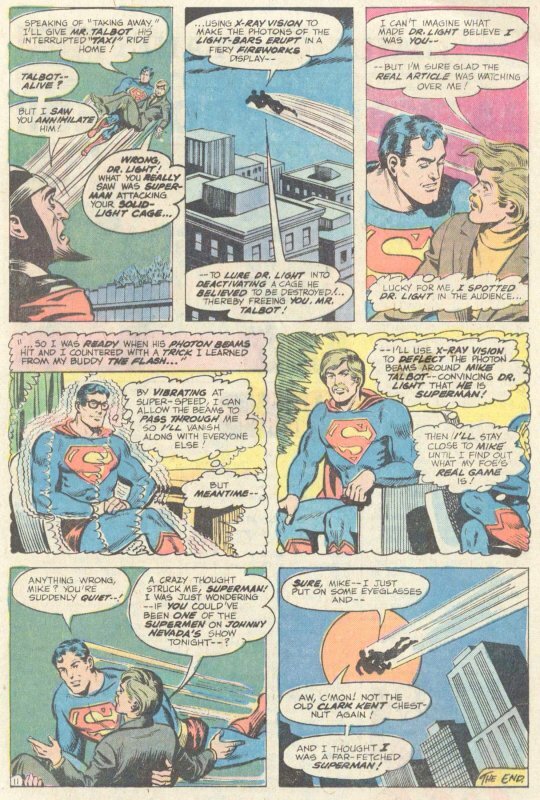 After the broadcast, Light disguises himself as a cab driver, picks up Talbot, then drives him to an abandoned junkyard where the taxi transforms into a cage to trap his Kryptonian captive. 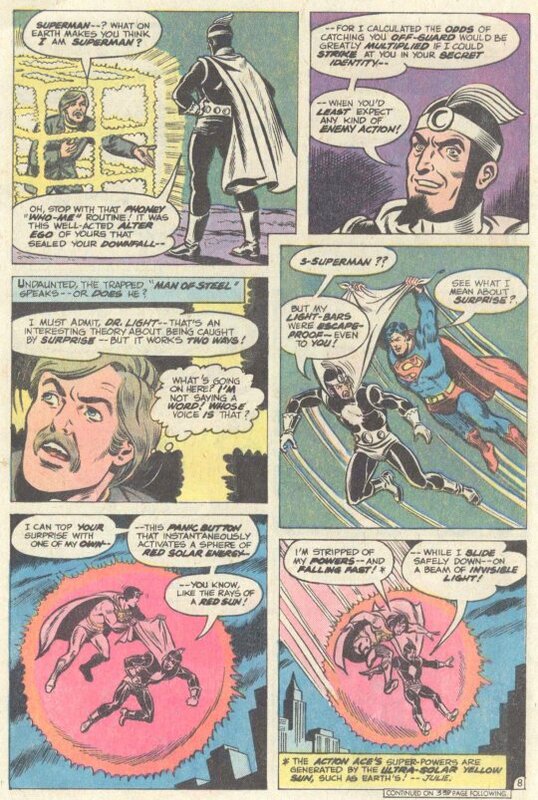 Unfortunately for Doctor Light, as we already know, Talbot isn’t Superman, and the real Man of Steel shows up to catch Light unawares. There’s a brief fight, but Superman isn’t really in any jeopardy–he thoroughly outclasses Light, straitjacketing the villain up in his indestructible cape. And then, as e flies Talbot back to his hotel, the Man of Steel reflects on the fact that he had spotted Dr. Light in the audience, and both vibrated his molecules Flash-style to allow Light’s emanations to pass through him, and he used his X-Ray vision to reflect them back off of Talbot–making Talbot the target of Light’s attack but allowing Superman to catch him unawares. It’s a very slight story, but given that it all fits into 11 pages, that’s not entirely unexpected. The back-up story is also illustrated by Schaffenberger, and is the latest in the Private Life of Clark Kent. 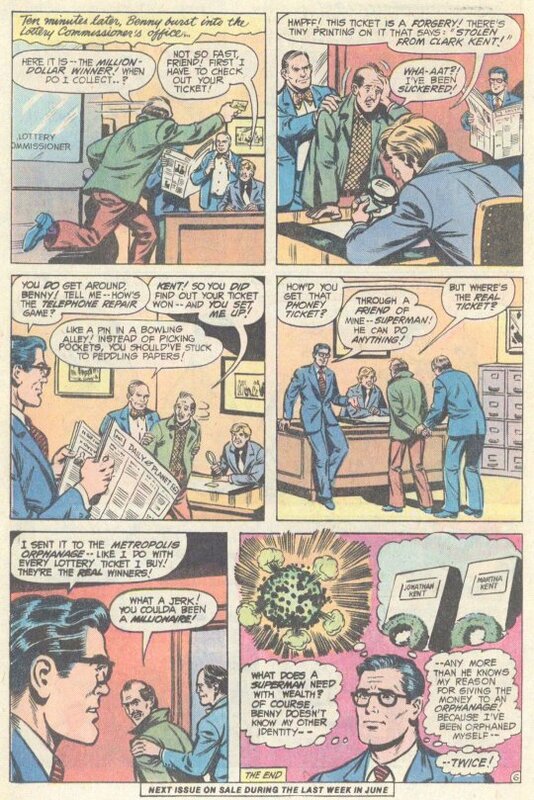 It’s all about Clark’s weekly routine at the newsstand in the Daily Planet lobby where he weekly buys a lottery ticket from the proprietor, Benny. Benny has such a good memory that he can remember the numbers on the tickets he sells Kent–which becomes a problem when one of those tickets is a winner. Benny tries to pick Kent’s pocket to get the wining ticket for himself, and when that fails he breaks into Kent’s apartment looking for it. 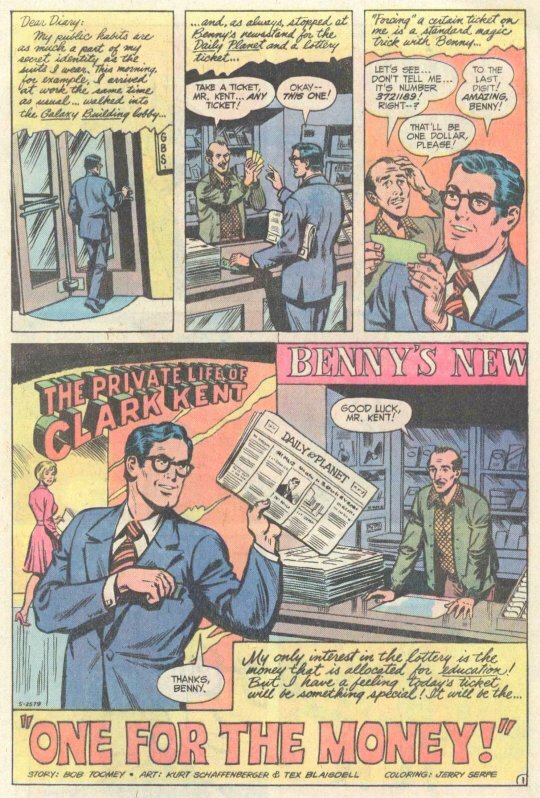 Once he realizes what is going on, Clark allows Benny to pick his pocket–but it’s a special forged ticket that Benny gets from Kent, one that says that it was stolen from Clark Kent in the fine print. Benny is arrested, and Kent reveals that he routinely sends his lottery tickets to the Metropolis Orphanage, since he doesn’t need the money himself and he knows what it’s like to be an orphan. Again, this is a lightweight entry, but Schaffenberger’s artwork makes it appealing nonetheless.